Been there, done that. : Eye Spy is on the RUN! Eye Spy for today has my little pink panther running in another game of tag. I don’t care much for these games but since Yolanda Renee at Defending the Pen was such a good sport, I can at least do the same. First though I would like to mention that my friend Roland Yeomans has another great read out there for your enjoyment. Ghost of a Chance is on my bedside table now and although I have just started reading it, I can tell this is going to be another great one by Roland. Who does not love a great ghost story, especially when it involves some of the great legends of all time and a most unusual murder? You can pick it up Here. So here are the questions from this game of tag. —What is the working title of your book? Actually I am still undecided but I am going under the working title Gods and Fairy Tales. I believe that this is going to be a series of three books. The first one entitled Secrets of the Ash Tree. —Where did the idea come from for the book? My fascination for the culture of the country I am living in. Norse Gods are evident through old Viking relics which surround the landscape. Folklore is also a big part of Norwegian tradition so I decided to combine the two. Also I think Trolls are misrepresented and they have a different story to tell. —What genre does your book fall under? —Which actors would you choose to play your characters in a movie rendition? Ones that could act, actually I have not given it a thought. —What is the one sentence short synopsis of your book? A young woman discovers her father’s secrets which cast her into a world full of dangerous creatures, mighty Norse warriors and perils beyond her belief. —Will your book be self-published or represented by an agency? I am considering both options. —How long did it take you to write the first draft of your manuscript? Been working on it for a year and it is still a work in progress. —What else about your book might pique the reader’s interest? Besides the Mythology and Folk lore this is a story about self-discovery, sacrifice and survival. The story is based on two different worlds, and what happens to one person when these two worlds collide. Sometimes turning everything upside down is the only way anything makes sense and this story does so by questioning what is real and what is not. 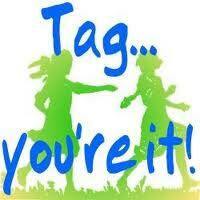 And Tag! You’re It! Why did I pick you? Because I want to hear more about your writing. This is the game and I’m just following the rules! Link back to my blog, answer the questions, tag three more and let them know. Have a great hump day and come back on Friday to see what I have in store for you. If you have something you want to share on my Eye Spy posts each Wednesday let me know! Ones that could act - funny! Like Alex, I thought the comment about good actors was both funny and spot on. Kristin Stewart from the TWILIGHT movies always jarred my enjoyment of the movie. Thanks for tagging me. I love Norse warriors. Hope to learn more about trolls when you finally publish this. Congrats on the book! It sounds great. Is going to be in E book form also. Congrats about on the book! I'm so excited for you.